My sister, brother-in-law and I are going through a rough patch right now. Health issues, finances, trying to make it with radically reduced incomes...then the car breaks down. The 12 year old TV rolls over and dies. A sprained ankle causes a lost day's work. Things which used to be "little things" now seem like "big things." So I went to this coming Sunday's lectionary readings, looking for strength, consolation, or solace. But when I turned to this passage, I heard a much diferent message - that a truly GOOD person, a righteous person, will have wealth and riches, no fear of bad news, a steadfast heart, and no fear. And my first reaction was, "Well, I guess that's pretty convicting, 'cuz that's exactly NOT what we're getting!" Now, I know - I'm no saint. Never have been. And I trust in the Gospel, that all who believe and are baptized will be saved. But it's hard, at times, to recognize that it's at least partly my failures at truly righteous living that have brought me (and those I love) to these kinds of impasses. And it just hurts a bit when it's the Bible rubbing my face in it. I know that elsewhere in the Bible, it tells me that "there are none who are righteous, not even one. there is no one who understands, no one who seeks God" (Romans 3:10). I know that there is much of our current condition that has absolutely nothing to do with my unrighteousness. My head knows this, even as my heart struggles with it. It seems that when I'm down, the old tapes can start playing, and I can become the Steve-of-old who heard "the good news," but was still waiting for the one Bible passage that would "vote him off the island..."
In the rooms of recovery, I frequently hear someone say "Why is this HAPPENING to me?" The answer frequently is, "Buddy, it's just HAPPENING - it's not specifically happening TO YOU..." I know, in my heart, that there's lots of people with troubles, and we are hardly unique in our struggles. In the end, my help comes from another Psalm - the 23rd - and I remember that no matter how dark and terrifying the road I walk (even through the valley of death), God is with me. I have a Shepherd who loves and cares for me - rich or broke, homeless or living in a penthouse. As a friend often tells me, "It's not like anyone gets out of this life alive, Steve..."
So I keep on keepin' on, and I trust that God will be with us, even when it seems like the rest of the world might be against us. That's what I understand "faith" is all about, in the end. God of mercy and lovingkindness, remind me that no matter where I am, you are there with me. Sometimes life just seems overwhelming, and hope seems far away. That's when I need to be reminded that my hope is in you. Amen. A couple things in the local papers - articles which have been echoed nationally - have really angered me lately, and it's time I get this off my chest. The first anger-inducing headlines were about how home prices have dropped for the fourth straight quarter. You can read about it in this Money.cnn.com article, with the caption "Mortgage Meltdown 2007." The part that all these articles don't mention is the thing that has been happening for much more than a year - and that's the long-standing freeze in the mid-priced housing market. Up until recently, if you wanted to buy or sell a half-million-dollar or better house, it was no big deal - because people in that economic strata hadn't been hit with the economic two-by-four that many of us now face. But I knew a year ago, visiting my sister's neighborhood on the southwest suburbs of Toledo, that the housing market was already showing signs of rigor mortis, because in a neighborhood of 50 or 60 condos in the $150-200K range, there were 12 of 'em for sale. A quarter of the housing stock in this reasonably-new (less than 10 years old) development was on the market - with almost no movement whatsoever. My sister and her husband had already lost nearly $40,000 in equity two years ago, trying to get out of the two-story house which they could no longer live in because of Sue's advancing MS and fibromyalgia. They'd been clobbered by the soft housing market two years ago. I truly do understand that what the market is measuring is the price of homes that actually sold - and that average is down considerably for four quarters straight. But no one is measuring the devastating effect of the homes that won't sell - like my friend John's house in Lexington, sitting empty on the market for a full year. If you factor in the homes whose sale price is zero - those that haven't (and likely won't) sell, then the market is in a much, much scarier place. When you look at the group of people being affected by this, they are what used to be called the lower-middle class - working stiffs whose home was their single biggest asset, and their single biggest investment. These are also the people whose employers (where they are still employed!) are also squeezing them on health care. Sue went from reasonably good employer-paid HMO health care with reasonable cost sharing to a 70%/30% plan with a vastly reduced prescription formulary and much higher co-pays. This happened even as she went from more than $15 an hour to barely $10. Less money, more costs, and no cushion in sight. The tragic part about this is that it wasn't front-page news until the melt-down in the sub-prime market affected Mr. and Mrs. Lexus-and-BMW's ability to sell their half-million-dollar house to move up to the $750k one with the granite countertops. Once they couldn't get what they wanted, boy, it was Oh, the humanity!..." everywhere. Honey, we have been there. For a while. For ten years or more, economists have been warning about the housing boom and the home-equity mortgage market that has been propping up consumer spending. Without those two things fueling the economic engine (and with it stock prices), there would have been a considerable retraction before that - and the White House couldn't have afforded that, now could they? Well, folks, the vultures are coming home to roost - folks like us have been watching the flies circling these particular corpses for quite a while. The Toledo Blade's recent report says that 22% of Toledoans - more than one in five - are living below the poverty line. Detroit (a scant 40 miles away) has the unenviable position of having the highest percentage in the nation for big cities of people under that ugly line. And there are a whole bunch of people like my sister and brother-in-law who are hovering just above that dreaded line. People who may become the last generation in their family to have the "American dream" of home ownership. Like an iceberg, I'm afraid that the true size of the problem has been hidden up to now, and I don't know what we can do to recover from it. And yet our President can still justify what is upwards of $400 billion in costs for the Iraq war - not to mention the human costs of 4,031 lives in the coalition forces, more than 27,000 wounded and crippled US soldiers, and more than 70,000 civilian casualties (possibly much higher). We need a different set of answers, people. "He knows how we are formed..."
I have a milk-carton in my room - I use it as a step-stool (among other things). It's heavy-duty enough that it will hold me. I would never use it, however, to support my brother-in-law AND me - because we are two equally hefty guys. They'd collapse in seconds. 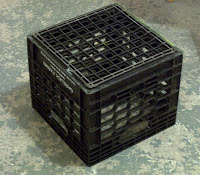 And I'd never, ever even consider using that poor milk-crate to jack-up a car (even a light-weight one like mine). Why? Because it's not built for that. Never was, for that matter. I know how it was made; I know what it will support. How is it that people can understand this image clearly, and yet not give the God of the heavens credit for the same understanding? Isn't it funny how on one hand, we acknowledge God as the creator of everything, and yet so many of us believe that God is somehow ignorant of our imperfect natures? How many people have felt that a holy God could not stand our presence - believing that our very nature is horrific to God, because we are stained and unholy, while God is perfect and holy? Read that passage from Psalm 103 (Sunday's psalm reading) again. God MADE us. God KNOWS us. God "knows how we are formed, he remembers that we are dust." God knows who we are, how we are, and what we are capable (and incapable) of enduring. How can God be ashamed of the very imperfect nature that he created? When people (including some prominent theologians) try to push this idea that God cannot stand to be in my presence because of "my hateful sin," I have to remember Max Lucado's famous words: that God's only Son died because he'd rather go to Hell FOR me than to go to Heaven WITHOUT me. Thank you, God, for knowing who and what I am - and loving me anyway. Amen. 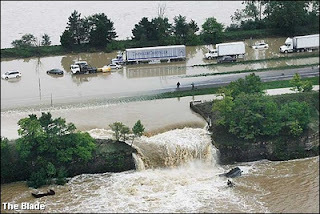 This was the scene Wednesday in Findlay, OH, where sister Sandy lives (Sandy's the one I don't live with). She works for Marathon Oil, whose headquarters were shut down Tuesday through today due to the flooding of the Blanchard River. Sandy and her family are safe and sound, though there were a number of rescue trips involved in the process. 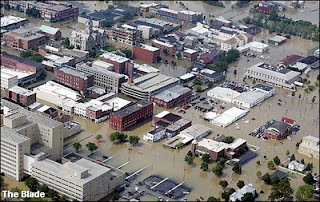 We here in Waterville are on the Maumee River, which has a huge flood plain and empties into Lake Erie, so we have no flood issues. We are struggling with power and internet connectivity as a result both of local construction and the water, but we are high and dry, so far. There is much to be thankful for in that simple truth, even as I mourn with so many others in Findlay, Ottawa and other surrounding Ohio communities which are struggling with the aftermath of the Blanchard River flooding. For more photos, check out the Toledo Blade photo series here and the related article here. It's a quiz. I promise you, it will be time well spent. This is not a slam at this one denomination; they are not alone here. My own denomination has been known to fiddle while Rome burned, too. It's the fundamental question we must address - can we become "fundamentalists" about what's really important, here? You can't even get out of bed! Good moanin' - actually got caught up on sleep and fluids this weekend. I had gotten quite dehydrated, just by not being intentional about water and other liquid intake. Not a good thing for this boy, so I am starting Monday feeling a bit better than I have in a while. Made for some scary times over the last two weekends, though...made me very weak, sluggish. When I'm near 90% on the sloth scale, that ain't a good thing. So it's good to be past that. One of the truly sinful pleasures of the summer is what we call tomato bread, although the process has grown over the years. Our version now starts with Cole's frozen garlic bread, a sprinkle of mozzarella cheese, a thin slice of Krakus Polish ham, another sprinkle of mozzarella, then a layer of thinly-sliced beefsteak tomatoes, with a layer of mozzarella and liberal sprinkles of Parmesan cheese and Italian seasoning. Bake for 10 minutes, until the garlic bread is done and the cheese is brown and bubbly. Is it healthy? Not hardly. Is it one more proof that God loves us and wants us to be happy, on occasion? You betcha! For now, it's back to the rock-pile, making little digital rocks out of big ones. That's a whole 'nuther topic, but we'll leave it on an upbeat note for now! I was talking with a guy last night who has been absolutely unable to get more than 7 days sober in a row. He and I were sitting in Wendy's after the meeting last night, and he talked about how useless and hopeless he felt, and how easy it would be to just steal a gun and end his life. I gave him the very best I had - the very best God has given me to share. I talked to him of God's love - how God loves the ones who are otherwise unlovable, how God manages to use scrap material to build mighty tools for his Kingdom. I shared what was shared with me by loving and caring believers and people in recovery. I don't know if he heard it, though. (I hope he did, obviously.) But that little voice in the back of my head started talking, saying things like, "So why do you even bother? You keep talkin', and people keep getting drunk. And you aren't any richer, or more physically fit, and you have no permanent relationship with anyone and nothing to show. So why even try?" That's why I keep this passage from 1st Chronicles close by my desk. It was given to us on bookmarks when I started school four years ago, and it's meant the world to me over the years. The best ministry advice I ever got came from an old coot who told me, "Steve, there are days when the only thing you can do is keep on keepin' on. Not because we're gonna succeed against the darkness, but because we are called to be light that others can seek out. We just never know which kindness we do will end up changing a life forever. So we gotta keep doin' it..."
What he was telling me was simply another way of saying, "Be strong and courageous, and do the work." Then this morning, an email came to tell the rest of the story. A number of years ago, I met two young men, both aged 24. One was getting out of prison after 7 years for being an accessory to an alcohol-fueled shooting; the other was a just someone that the bottle had washed up, chewed up and spit out. I took a lot of late-night phone calls, drank a lot of late-night coffee, and talked endlessly about God's love and God's claim on their lives. And then I moved away, and never knew the rest of the story. This morning's email was from the ex-convict - who passed his sixteen-year sobriety anniversary in April. His sober friend will celebrate ten years of continuous sobriety at the end of July, and they will both be speaking to other recovering folks this Friday. Both are fathers, husbands, friends, and loving children of God. Now, I can't take any credit for that. That's not my doing - that's God's doing. But it reminded me why I keep working with folks, keep giving my life and heart away, even when it seems hopeless. I'm called to do this, because for a few short weeks or months, I might be the person that someone can hold onto until they can find the inspiration they really need to get the understanding of God's love that can keep them sober. Because someone just might get sober and stay sober, if I can be a light in the darkness for a couple 24-hours. Because I might be one of the paving stones in the road that leads to a ten-year sobriety anniversary for a guy. I'm not called by God to be successful, or have a 90% conversion rate. I'm called to "be strong and courageous, and do the work." Period. If I died tomorrow, I would not be a success in the eyes of the world. Financially, materially, in terms of career or family or relationships, I have not done nearly as well as I could have. I am not a vision of physical beauty or desire. All my belongings would fit in a 17-foot rent-a-truck with room to spare - and most of them would mean nothing to anyone but me. I am writing to you from the 7th floor of Offenhauer West dorm at Bowling Green State University, the site of the state conference for the youth group I advise. And, as with many things, it has been a rather mixed experience. My friend Ted K. frequently uses the "Great Lakes freighter" analogy. Most freighter ships are imperfectly watertight - so there are a series of bilge pumps which constantly pump seeping water out of the "keel" (the bottom of the hull). If the pumps shut off, eventually, the water continues seeping in, and what appears to be a massive lake-going freighter will slowly settle to the bottom, never to rise again. In August of 1989 and 1990, I was an advisor when the Toledo area was proud of one of our own "native sons," a handsome young man who was the state presiding officer for the group. The chapter I was advising was active, making progress, and we were definitely at a "peak" in the organization's life cycle. There were three or four hundred young men involved at the state conferences that year, and it was a great time. I started off the weekend with mechanical problems coming back from Van Wert yesterday - tire problems that required repairs to my car (while my sister's is still waiting for repairs), so it just threw monkey wrenches into almost everything schedule-wise this weekend. I was way the hell behind schedule, and managed to leave some important things behind - like the fan I wanted to bring to help out with the dorm's failing A/C units, the pop, the extra towels. So there is certainly the possibilitiy that it's going to be a rather uncomfortable night. Now, before you say it...I know - really, I do. After all, on the way to the TireMan shop, we passed someone who was walking her dog down our country road in a motorized wheelchair. Things could be much, much worse than thy are. I know I'm blessed, and that these are all inconveniences - not critical issues. The real deal that's underlying all this is that a week ago Thursday morning I went to St. Luke's Hospital for an outpatient Doppler ultrasound scan of my left armpit. On the surface, this seems pretty benign - and for most people, it would be. But in the fall of 1972, as we moved from Niantic, Connecticut to Syracuse, NY, my father was finally diagnosed with lymphatic cancer. He had a radical lymphectomy, which bought him 5 years. But from the spring of 1977 on, he was essentially already dead. When he died, on August 14, 1979, he essentially looked like a concentration-camp survivor. It was not a pretty way to die. - I go for an ultrasound, followed by a biopsy. So this was the ultrasound stage of the game. Sadly, my obsession level has been pretty high, and I pretty much shut down other than showing up at work, and committing to go to the test and get it over with. The bad part is, ultrasound is a "strong positive" and a "weak negative." If it's bad enough to show up on ultrasound, it definitely requires additional action (biopsy). If not (as was the case for me), it just shows that the test didn't detect anything - not that there isn't a problem. So for now, it's just going back to the doctor, taking the next action, and waiting for the next set of threats to deal with. And this has been coloring more of my world than I've been willing to admit. So today, I have been working hard to keep rebooting the "gratitude routine" in my internal thought processes. It's important for me to do this - because I know in my heart that my attitude will color much more than my own experience of this weekend. My roommate and fellow advisor, the couple of young men from my chapter who are here, and their brothers and friends from around the state, will all be colored by what I "bring to the table" this weekend. So pray for me, if you will, that I can work hard to see all the blessings, the beauty and the possibilities in this weekend, rather than all the niggling details and crankiness. Because it will be the joy, and the beauty, and the possibilities in this weekend, that will make the difference between enduring these three days and being "an instrument of God's peace" in it.